We have a professional machinery park at our disposal that we use for the surface assembly of SMD components. Surface assembly with the use of the surface mount technology is carried out by the automated assembly device MIRAE MX 200LP. In the case of prototype projects, we are capable of carrying out the assembly with the use of manual assembly manipulators. To provide our clients with the highest quality of the SMD assembly we use only professional soldering pastes, glues and fluxes of highest quality and holding relevant attestations. Our new generation convection-type furnace is fully adjusted to both lead and lead-free soldering, thanks to which we can execute even the most technologically advanced projects without much of a problem. 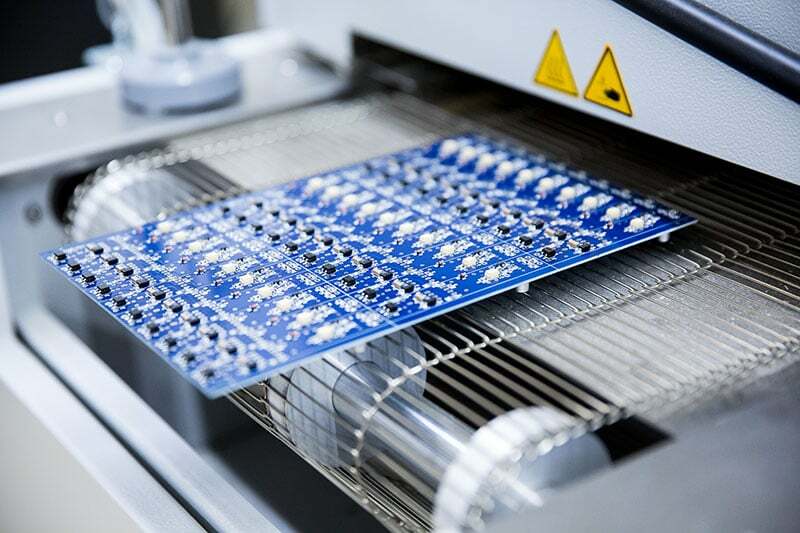 We adjust the soldering process individually to every printed circuit board. Every assembly is followed by a visual inspection of assembled circuits to ensure the highest quality of performed services. the capacity of or production line is 2 million components per month.